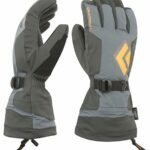 The Best Gloves for Hiking and Mountaineering in 2019 Recently updated ! While you are hiking, trekking or mountaineering, it is very likely that you will encounter harsh conditions like low temperatures, snow showers, rain and wind. To perform to the best of your abilities in such conditions, you need some proper hiking gear. The fingers are one of the body parts most prone to frostbites and therefore it is vital that you wear a pair of gloves when you are hiking in low temperatures. Gloves will keep your hands warm, dry and comfortable. However, gloves differ greatly in warmth and weather resistance. Therefore, it is important that you select gloves according to the conditions (temperature, precipitation etc.) you expect to encounter. 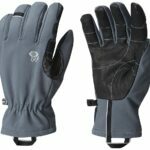 Here we selected and reviewed the best gloves for hiking and mountaineering. 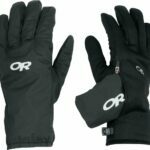 As we wanted to present you different options, we selected four pairs of gloves which are designed for winter activities (hiking, mountaineering, alpine climbing etc.) 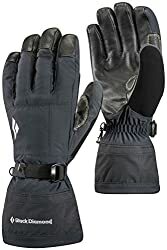 in low temperatures and one pair of lighter gloves intended for use in spring and fall. We only listed high-quality gloves which provide good durability and dexterity. Winter gloves are typically made of three layers (think of the layered clothing system); the liner is next to your skin and wicks moisture away while the insulation layer traps the body-warmed air to keep your hands warm. Lastly, the shell (outer layer) offers protection against rain, wind and snow, and is usually made of waterproof/breathable fabric. Some winter gloves have a removable lining so that you can dry it quickly or even use it as a standalone glove in warmer weather. Gloves for spring and fall differ from winter gloves in insulation material. While winter gloves utilize a synthetic fill (PrimaLoft or similar), gloves for spring and fall are typically made of fleece. Fleece doesn’t provide as good insulation as synthetic fill and therefore fleece gloves are less warm. 1. Buying Gloves for Hiking and Mountaineering – What is important? Winter gloves typically have synthetic fill insulation which is made of fluffy polyester fibers. These fibers create loft and thus efficiently trap body-warmed air. Polyester absorbs very little moisture and therefore gloves with synthetic fill insulation retain loft (and warmth) if they get exposed to moisture, snow or water. Lighter gloves are typically made of fleece or wool. Fleece and wool don’t provide as good insulation as synthetic fill – they have a lower warmth-to-weight ratio. For more information about insulation materials, check out our Comparison of Mid-Layer Materials. The shell is typically made of waterproof yet breathable materials such as Gore-Tex and Pertex. The shell provides weather protection and should be durable (abrasion-resistant). Some gloves have a removable shell. For more information about shell materials, check out our Comparison of Shell Materials. The lining is a very important part of the glove as it wicks the moisture away from the skin and thus reduces the conductive heat loss. Wet garments conduct heat much faster than dry garments and therefore you will quickly get cold if you wear wet garments. For more information about the conductive heat loss check out our Comparison of Base Layer Materials. Gloves should provide good dexterity so that you don’t have to take them off when for example putting on snowshoes, crampons or taking items out of your backpack. Weight (Pair) 13 oz. 8.3 oz. 8.2 oz. 6.5 oz. 2.8 oz. 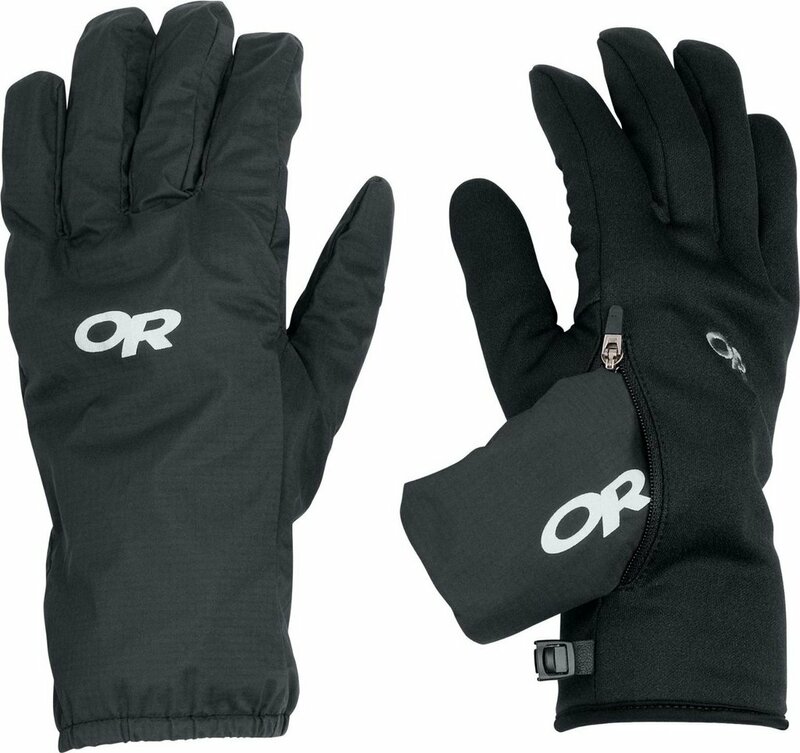 The Outdoor Research Alti gloves are the warmest and the most technical gloves in this review. 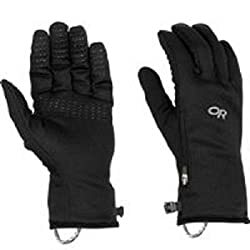 They are best for alpine climbers, mountaineers and others who plan to do trips in extremely harsh winter conditions and thus need a warm and durable pair of gloves. The gloves feature a shell with Gore-Tex inserts for protection against snow and wind. The insulation layer has 3.5 ounces of synthetic PrimaLoft Gold insulation, which offers a superb warmth-to-weight ratio, dries fast and compresses well. Furthermore, it maintains warmth even when wet – which does not apply to natural insulation materials like for example goose down. The manufacturer claims that the PrimaLoft Gold maintains 98% of its warmth when wet, which is indeed impressive. The innermost layer – the liner, is removable and insulated with PrimaLoft Gold synthetic fill (6 ounces). Therefore, it can be used as a standalone glove in warmer conditions. With Outdoor Research Alti gloves you thus get two pairs of gloves in one, so to speak. In addition to the advanced construction and materials, the gloves also feature pull loops, carabiner loops and gauntlet closures. The liners can be tightened at the wrists with a Velcro-type tightening system. The Outdoor Research Alti gloves provide great warmth and durability and are therefore perfect for mountaineers and alpine climbers. The Black Diamond Soloist gloves are most suitable for alpine climbers, mountaineers and hikers who often do long trips in very cold conditions. They feature a thin but durable shell which is made of Pertex Shield material and provides good weather protection and breathability. The palm of the shell is made of goat leather and uses Kevlar stitching for better durability. The fingertips are also reinforced with goat leather. The liner can be removed from the shell and used as a standalone glove. 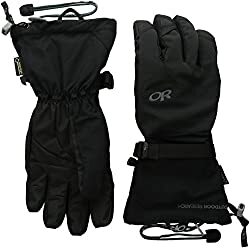 It is insulated with PrimaLoft Gold insulation (6 ounces on the backside, 5 ounces on the palm) and features a BDry waterproof/breathable insert for protection against the snow and wind. The gloves are also equipped with a single-pull adjustment system in the wrist area and a drawcord at the very back. On the middle fingers they have attachment points which allow you to attach the gloves with a carabiner to your gear (climbing harness, backpack etc. ), whenever you don’t need them. 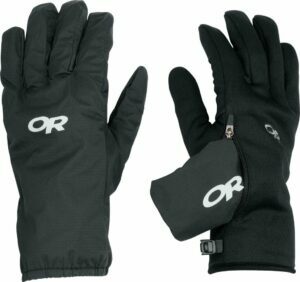 The Black Diamond Soloist gloves are slightly less insulated than the Outdoor Research gloves above, but they are still a great option for hiking, mountaineering and alpine climbing in very cold conditions. 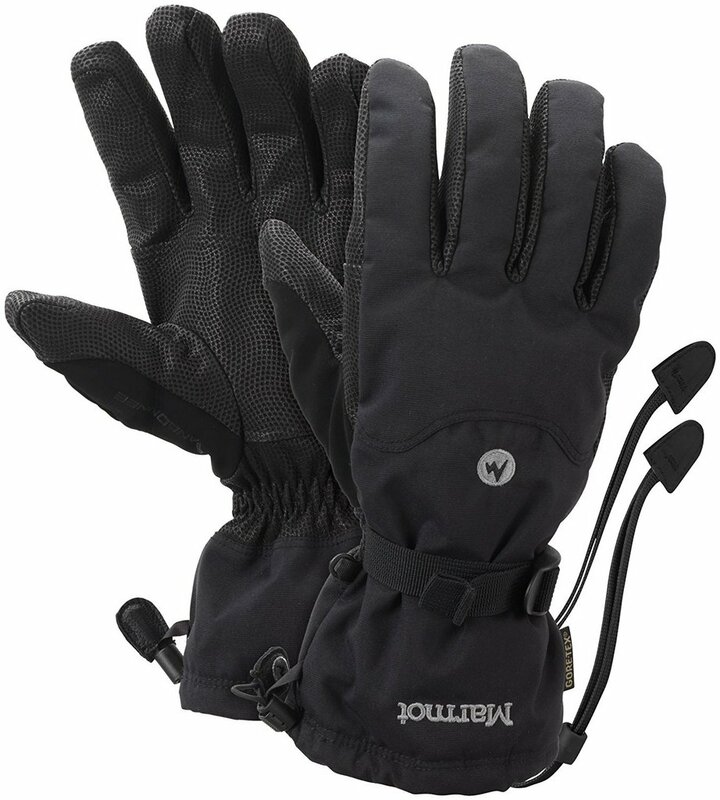 The Mountain Hardwear Torsion gloves are very sturdy, warm and lightweight. Therefore, they are best for alpine climbing and cold-weather mountaineering or hiking. The gloves have a water-resistant shell which is made of Deflection softshell fabric. The Deflection softshell fabric is very breathable and provides good protection against snow and wind. The insulation layer utilizes Mountain Hardwear’s Thermal.Q Elite synthetic fill which has a great warmth-to-weight ratio and retains warmth even if it gets wet. The Thermal.Q insulation mimics the structure of goose down and therefore compresses well. The palm of the glove is reinforced with water-resistant goatskin leather. The gloves are also equipped with pull-on loops, adjustable Velcro cuffs and carabiner loops. The Mountain Hardwear Torsion gloves offer good warmth for low weight and are thus great for different activities in cold weather. 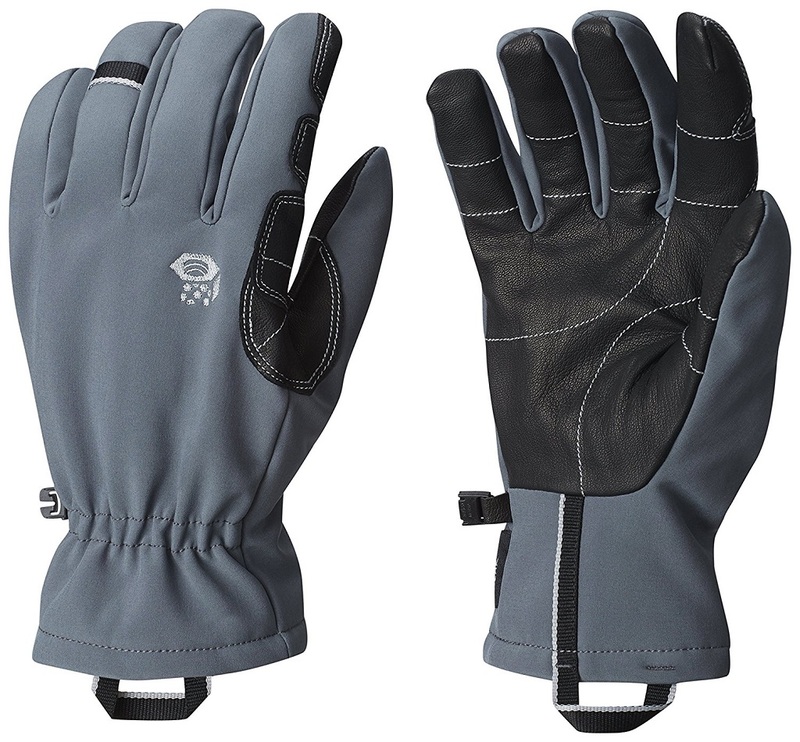 The Marmot Randonnee gloves provide great functionality for the price. The gloves feature a shell which is made of a 2-layer MemBrain material. The MemBrain fabric does not only provide good protection against snow and wind but is also very breathable. The insulation layer uses Marmot’s Thermal R insulation. The Thermal R insulation is made of polyester fibers and provides great warmth even if it gets wet. The gloves have DriClime lining which is made of two different denier yarns so that it efficiently pulls the moisture away from the skin where it spreads and evaporates. Furthermore, the DriClime lining is also very comfortable to the touch. 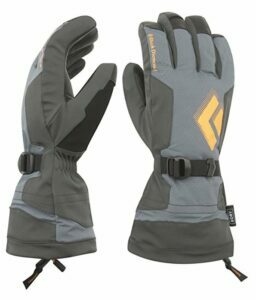 The Marmot Randonnee gloves feature a single-pull adjustment system in the wrist area and a drawcord at the back. 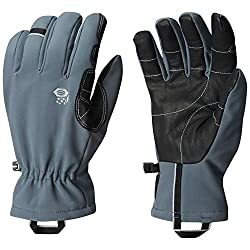 The Marmot Randonnee gloves are best for those who want a pair of high-quality winter gloves for a relatively low price. 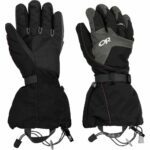 The Outdoor Research Versaliner gloves are much lighter and less insulated than other gloves in this review. Therefore, they are best for hiking in spring and fall. The gloves consist of two elements – the liner and a waterproof/breathable shell. The liner is made of fleece and thus provides warmth and wicks the moisture away from the skin. It also has silicone grip pads on the palm, a glove clip, pull loop and a zippered pocket. Inside the zippered pocket there is room for the waterproof shell which can be worn over the liner in case of bad weather. The shell is made of the wind-resistant and waterproof Pertex Shield fabric. 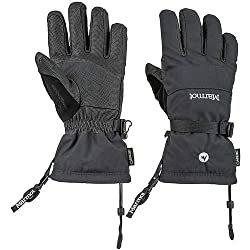 The Outdoor Research Versaliner gloves are a great option for recreational hikers and mountaineers who want to keep their hands warm in spring and fall.